Liczba stron: 2658 Jest to ujednolicona liczba stron, która ułatwi Ci porównanie długości książek. Każda strona Legimi to 200 słów. 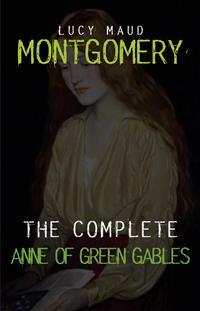 This book contains the Anne of Green Gables complete collection. There are plenty of people in Avonlea and out of it, who can attend closely to their neighbor’s business by dint of neglecting their own; but Mrs. Rachel Lynde was one of those capable creatures who can manage their own concerns and those of other folks into the bargain. She was a notable housewife; her work was always done and well done; she “ran” the Sewing Circle, helped run the Sunday-school, and was the strongest prop of the Church Aid Society and Foreign Missions Auxiliary. Yet with all this Mrs. Rachel found abundant time to sit for hours at her kitchen window, knitting “cotton warp” quilts — she had knitted sixteen of them, as Avonlea housekeepers were wont to tell in awed voices — and keeping a sharp eye on the main road that crossed the hollow and wound up the steep red hill beyond. Since Avonlea occupied a little triangular peninsula jutting out into the Gulf of St. Lawrence with water on two sides of it, anybody who went out of it or into it had to pass over that hill road and so run the unseen gauntlet of Mrs. Rachel’s all-seeing eye. She was sitting there one afternoon in early June. The sun was coming in at the window warm and bright; the orchard on the slope below the house was in a bridal flush of pinky-white bloom, hummed over by a myriad of bees. Thomas Lynde — a meek little man whom Avonlea people called “Rachel Lynde’s husband”— was sowing his late turnip seed on the hill field beyond the barn; and Matthew Cuthbert ought to have been sowing his on the big red brook field away over by Green Gables. Mrs. Rachel knew that he ought because she had heard him tell Peter Morrison the evening before in William J. Blair’s store over at Carmody that he meant to sow his turnip seed the next afternoon. Peter had asked him, of course, for Matthew Cuthbert had never been known to volunteer information about anything in his whole life. Mrs. Rachel rapped smartly at the kitchen door and stepped in when bidden to do so. The kitchen at Green Gables was a cheerful apartment — or would have been cheerful if it had not been so painfully clean as to give it something of the appearance of an unused parlor. Its windows looked east and west; through the west one, looking out on the back yard, came a flood of mellow June sunlight; but the east one, whence you got a glimpse of the bloom white cherry-trees in the left orchard and nodding, slender birches down in the hollow by the brook, was greened over by a tangle of vines. Here sat Marilla Cuthbert, when she sat at all, always slightly distrustful of sunshine, which seemed to her too dancing and irresponsible a thing for a world which was meant to be taken seriously; and here she sat now, knitting, and the table behind her was laid for supper. Something that for lack of any other name might be called friendship existed and always had existed between Marilla Cuthbert and Mrs. Rachel, in spite of — or perhaps because of — their dissimilarity. Matthew enjoyed the drive after his own fashion, except during the moments when he met women and had to nod to them — for in Prince Edward island you are supposed to nod to all and sundry you meet on the road whether you know them or not. He walked jauntily away, being hungry, and the unfortunate Matthew was left to do that which was harder for him than bearding a lion in its den — walk up to a girl — a strange girl — an orphan girl — and demand of her why she wasn’t a boy. Matthew groaned in spirit as he turned about and shuffled gently down the platform towards her. They had driven over the crest of a hill. Below them was a pond, looking almost like a river so long and winding was it. A bridge spanned it midway and from there to its lower end, where an amber-hued belt of sand-hills shut it in from the dark blue gulf beyond, the water was a glory of many shifting hues — the most spiritual shadings of crocus and rose and ethereal green, with other elusive tintings for which no name has ever been found. Above the bridge the pond ran up into fringing groves of fir and maple and lay all darkly translucent in their wavering shadows. Here and there a wild plum leaned out from the bank like a white-clad girl tip-toeing to her own reflection. From the marsh at the head of the pond came the clear, mournfully-sweet chorus of the frogs. There was a little gray house peering around a white apple orchard on a slope beyond and, although it was not yet quite dark, a light was shining from one of its windows. With a sigh of rapture she relapsed into silence. Matthew stirred uneasily. He felt glad that it would be Marilla and not he who would have to tell this waif of the world that the home she longed for was not to be hers after all. They drove over Lynde’s Hollow, where it was already quite dark, but not so dark that Mrs. Rachel could not see them from her window vantage, and up the hill and into the long lane of Green Gables. By the time they arrived at the house Matthew was shrinking from the approaching revelation with an energy he did not understand. It was not of Marilla or himself he was thinking of the trouble this mistake was probably going to make for them, but of the child’s disappointment. When he thought of that rapt light being quenched in her eyes he had an uncomfortable feeling that he was going to assist at murdering something — much the same feeling that came over him when he had to kill a lamb or calf or any other innocent little creature. Marilla went slowly down to the kitchen and proceeded to wash the supper dishes. Matthew was smoking — a sure sign of perturbation of mind. He seldom smoked, for Marilla set her face against it as a filthy habit; but at certain times and seasons he felt driven to it and them Marilla winked at the practice, realizing that a mere man must have some vent for his emotions. But it was morning and, yes, it was a cherry-tree in full bloom outside of her window. With a bound she was out of bed and across the floor. She pushed up the sash — it went up stiffly and creakily, as if it hadn’t been opened for a long time, which was the case; and it stuck so tight that nothing was needed to hold it up.